We’d love your help. Let us know what’s wrong with this preview of Cocoa Beach by Beatriz Williams. Burdened by a dark family secret, Virginia Fortescue flees her oppressive home in New York City for the The New York Times bestselling author of A Certain Age transports readers to sunny Florida in this lush and enthralling historical novel—an enchanting blend of love, suspense, betrayal, and redemption set among the rumrunners and scoundrels of Prohibition-era Cocoa Beach. To ask other readers questions about Cocoa Beach, please sign up. Vicki To Kristen i hope she would do a book about Portia as well she was the only interesting person in the book. I met my husband in the least romantic setting possible: a casualty clearing station in northern France in the middle of February. A cold drizzle fell and the air stank of human rot. I suppose this constituted a warning from Providence, though Providence needn’t have bothered. I had always known better than to fall in love. I had always known love was something you would later regret. Miss Virginia Fortescue is a good and decent person. In 1917, a twenty-year-old with a knowledge of cars, thanks to her father, she volunteered in WW I as an ambulance driver on the front lines in France. In this world of darkness she also found a bit of light, in the person of a dazzlingly charming English doctor, Captain Simon Fitzwilliam. Sparks fly. Of course there are obstacles to be overcome. What about Virginia’s presumed immunity to such blandishments? What about his reputation as a womanizer? What about reports of his having a wife and child back in England? We know very early in the story, from encountering the quote cited above, that barriers will be crossed. We can also expect that trenches will be dug, ordnance will be employed, and opposition will be fierce. The relationship between Virginia and Simon is certainly central, but the real meat of this novel lies in a mystery. Someone has cleared the ruins away, but you can still see that a house burned to the ground here, not long ago. The earth is black and charred and the air smells faintly of soot. Virginia got news a short time before that Simon had died in that fire. She left New York with her two-year-old, Hazel, to see for herself what the situation was with the family holdings down there, and try to find out what Simon had been up to during his time in The Sunshine State. She is soon joined by Simon’s ne’er do well brother, Sam, and their sister Clara. From her arrival, Virginia is out of her element. Simon’s lawyer takes care of her initial arrangements, but was clearly expecting the grieving widow to be compliant and demure instead of inquisitive and assertive. The 20s was a time of great social change. Women stepping out of traditional roles more and more was a key element of the period. Virginia slowly finds and fits-in pieces of the puzzle. There are three streams to the tale. The contemporary (1922) setting in which Virginia is trying to make sense of everything in south Florida alternates, more or less, with a look back from Simon and Virginia meeting and courting during the war, to the point when they are separated. The third element is Simon’s letters to Virginia from Florida, hoping to gain back her trust and affection. In order to figure anything out you need facts. You need people to tell you truthfully about what they know. You need records that have not been falsified or misplaced. Virginia finds herself one of the only straight arrows in a quiver full of boomerangs. Did Simon lie to her about his brother Sam? Did he lie to her about what happened to his first wife? Is Sam lying to her about Simon? Is Clara telling her all that she knows? Simon hinted in his letters at dodgy doings in Florida as he tried to salvage the family business, and says he was trying to get out from under such entanglements. Was that true? And when she is approached by a federal agent, can she believe what he tells her? To add to the challenge, how much can Virginia believe her own memories? She had been seriously concussed in the war and that had some lasting repercussions. She has cause again, in her post-war experiences, to wonder at her own perceptions and recollections. But as squishy as Virginia’s take may be from time to time, of more concern is the maelstrom of dishonesty in which she finds herself. Mrs Virginia Fitzwilliam is no hand-wringing damsel in distress. She is a tough broad contending with dark forces in her attempt to find truth. One of the great successes of this novel is how Williams keeps you flipping the pages, eager to know what happens next. She manages to sustain an impressive level of tension throughout, offering a steady supply of small questions to be answered, small battles to be fought, in building up to the big finale. Who can Virginia believe in this perfidious paradise? And what clues can she unearth to keep from being sent wandering off into minefields? Cocoa Beach is part of a trilogy (so far) of 1920s books linked by a Revenue Service agent named Marshall, among other connections. He is a secondary character here, more prominent in The Wicked City. Virginia’s family story was told in the wonderful novel, A Certain Age, in which hers is among the secondary roles. She dashes off for Florida at the end of that. We get bits of that story as some details of her father’s travails are sprinkled in. You don’t need to have read that book before this one, but if you have not, there is definitely material in this one that is very spoilerish for that one. If you intend to read Williams’ group of Jazz Age books, begin with A Certain Age. Gripes are few. Beatriz Williams writes of various historical periods. This is the third Williams novel I have read, (there are plenty more) all three set in the 1920s. Each has a core male-female relationship, and I suppose a bit of the romance-y material is unavoidable. Descriptions of how manly this or that guy looked to Virginia made me mentally drum my fingers hoping for it to pass quickly. (I do recognize that this is an unfair gripe.) But I have also learned in reading these books that the romance, while structurally and motivationally important, is kept within reason. I read and enjoyed Cocoa Beach for the tension, the danger, the need to know what’s gonna happen next. Also, the cover seemed a miss to me, informing readers of little about the content of the book, beyond the setting in time and centrality of a young woman. That said, Cocoa Beach is a compulsive page-turner, a perfect fun summer read. You may pick up a bit of knowledge about what a few parts of the world were like a century ago, endure, or enjoy, a bit of large-scale and smaller-scale warfare, but mostly you will read this for the fun and excitement. And that’s no lie. I wasn’t super excited to read this book when I got the ARC off Edelweiss, because I’ve found myself growing gradually more frustrated with Beatriz Williams. Her first three books were great, soapish beach reads—plenty of twisty drama, but not dumbed down. But the next three were kind of disappointing. It began to feel like maybe she was rushing through them, focusing more on setting up the next book than on telling the story at hand to the best of her ability. But the thing is, none of the book I wasn’t super excited to read this book when I got the ARC off Edelweiss, because I’ve found myself growing gradually more frustrated with Beatriz Williams. Her first three books were great, soapish beach reads—plenty of twisty drama, but not dumbed down. But the next three were kind of disappointing. It began to feel like maybe she was rushing through them, focusing more on setting up the next book than on telling the story at hand to the best of her ability. But the thing is, none of the books are true, direct sequels to one another. Even though they all take place in the same universe and they’re all very loosely connected (usually through Julie Schuyler), it felt like she was leaving lots of threads hanging. She was also dropping many references to things in her other books that I was struggling to remember properly, and that could be confusing. But I gave in eventually. I just couldn’t resist. And I’m glad I did, because I think it was her strongest book since Tiny Little Thing. This one follows the adventures of Virginia Fortescue, the sister of the protagonist from A Certain Age. Even though I was iffy on that book, I do think it will help most readers to have also read that one recently because it gives you a lot of background information on the family drama. The narrative alternates between France in WWI and Cocoa Beach five years later. Virginia worked as an ambulance driver in Europe while the events of A Certain Age were going down, and there she met a handsome British army surgeon, Simon Fitzwilliam. They carried on a passionate affair, but his own family secrets eventually drove Virginia to leave him and return home to her family in New York. Five years later, she receives word that her husband has died and travels to Cocoa Beach to settle his affairs. Naturally, she comes to realize that everything is not as it seems. One of the reasons that I think this was stronger than her last book, The Wicked City was that here Williams focused on just one story instead of two. I feel like when she’s writing books with two distinct storylines, one of them invariable suffers from the feeling that it’s been shoehorned in. That certainly wasn’t a problem this time. Virginia’s story felt complete, and the elements of the two timelines nicely informed each other. The story was even twistier than usual, and I was genuinely surprised by the direction it eventually went in. We follow Virginia and Simon Fitzwilliam as the book Falling in love and marrying during a war usually turns out to be a good thing, but for Virginia Fortescue Fitzwilliam it wasn't working out. Beatriz Williams is an unfamiliar author to me. I decided to read COCOA BEACH because the premise sounded intriguing, & I always find it difficult to resist covers with water in the background. (Not sure why...🤔) So I'm not sure if it was necessarily the book, the fact that I'm not a fan of Willams' prose, &/or a combination of both. I'm definitely in the minority here & I can see this appealing to many readers, but I'm just not one of them. I didn't enjoy a single aspect of COCOA BE Beatriz Williams is an unfamiliar author to me. I decided to read COCOA BEACH because the premise sounded intriguing, & I always find it difficult to resist covers with water in the background. (Not sure why...🤔) So I'm not sure if it was necessarily the book, the fact that I'm not a fan of Willams' prose, &/or a combination of both. I'm definitely in the minority here & I can see this appealing to many readers, but I'm just not one of them. I didn't enjoy a single aspect of COCOA BEACH honestly. Sad; I was so looking forward to this one! Right off the bat, the past/present flashbacks irked me. Many times I found the text repetitive & somewhat confusing, because I felt the pacing was inconsistent. The fact that I couldn't connect or feel for any of any of the characters didn't help. Virginia was such a boring MC & I got tired of her inner dialogue, as well as the dialogue she carried with others. Again, I'm not sure if this is just the Williams' method, but everything was so melodramatic I swore I could have been reading a soap opera drama! I wanted some good historical fiction, but jeez, not like this. I'm aware that authors often attempt to incorporate a romance theme into everything, but the relationship between Virginia & Simon was cringeworthy & uncomfortable. The whole thing felt like a facade, each chapter trying to top the last by adding another twist. ("Tune in next week to find out what will happen on...") I just loathed them both. The "mystery" arc was predictable & it took too long to drop the ball. The flashbacks worsened this, making me eventually lose interest. (I lost interest in this within the first 20%, but finished because it was on my TBR for several months & wanted to give an unfamiliar author a chance to prove me wrong.) Well. That was a mistake. Well I love the authors previous books but I did not enjoy this one. The frantic nature of the entire book wore me out. I did finish it but only because I had to know the ending. Virginia is definitely a strong woman. When we first meet her she is driving an ambulance in France during WWI. She left her family home and all of her secrets behind in New York and ran away to France to help with the war. While there she meets a British doctor, Simon, who will change the whole course of her life. The book moves between Virginia's days in France and five years later when she moves to Florida to try to find out what happened to her husband and to settle his estate. This move put Virginia is definitely a strong woman. When we first meet her she is driving an ambulance in France during WWI. She left her family home and all of her secrets behind in New York and ran away to France to help with the war. While there she meets a British doctor, Simon, who will change the whole course of her life. The book moves between Virginia's days in France and five years later when she moves to Florida to try to find out what happened to her husband and to settle his estate. This move puts her life and the life of her young daughter in danger and she continues to face challenges as she tries to solve the mystery surrounding his death. This was a fantastic very readable book. The author knew both time periods very well and managed to give us a look at life in the early part of the 20th century as she crafted an immensely interesting mystery plot. I highly recommend this book to anyone who enjoys historical fiction. Thanks to goodreads for a copy of this book for review. I've never read this author before and I enjoyed this book so much that I'm now ordering her older books to read. I received this via Goodreads Giveaways in exchange for an honest review. All my opinions are my own:). Not bad but ultimately failed to wow me *shrugs* Aah well. Virginia isn't really sure who to trust, or what to believe. Her estranged husband, Simon, has died in a fire at his home in Cocoa Beach. She decides to travel from New York to Florida to settle his estate and put her affairs in order. But Virginia suspects that the truth about what happened to her husband may not be what's been reported to her and the authorities. I realized while I was reading that this story has a 'something familiar feeling' to it that I get when I read Daphne du Maurier, I Virginia isn't really sure who to trust, or what to believe. Her estranged husband, Simon, has died in a fire at his home in Cocoa Beach. She decides to travel from New York to Florida to settle his estate and put her affairs in order. But Virginia suspects that the truth about what happened to her husband may not be what's been reported to her and the authorities. I realized while I was reading that this story has a 'something familiar feeling' to it that I get when I read Daphne du Maurier, I enjoy that 'something familiar feeling'. I was disappointed Williams didn't explored Virginia's feelings about all the things she discovered as we went along, I think it would have made the story more interesting. There are some big events that happen that we don't really get to hear her thoughts on and that was disappointing. The ending felt a little too neat and tidy given the way events unfolded. I needed a little more detail in order to feel like I could buy into that ending. The same goes for the resolution of what happened with her father. It felt very out of the blue and hard to digest without some more details. What I like about Williams's fiction is the character development and the relationships she creates. This story has some of what I've come to expect from her writing but the mystery and the way the truth was revealed could have been more polished and finely tuned. The flip flopping back and forth in the timeline works for the majority of the story but when it gets down to the nitty-gritty where the action happens in the timeline and it really seems to muddle things up. I'm especially confused by the timeline of events of June 22, 24, and 25 and why Virginia said what she did and set things in motion at the beach. I don't think that really makes sense when you go back two days before (June 22) and discover what she knew while riding in the car (trying to avoid spoilers here). The final scene did not make any sense to me at all so the whole book left me with an overall unsettled feeling...like 'hmm, what did I miss?" It appears this is a stand alone book so I didn't expect that I would need to be able to remember characters from other books. This review has been hidden because it contains spoilers. To view it, click here. This book was so confusing. It set up a great mystery that started out as beach-read style fun and then turned into an intense thriller in the last 2 chapters. The last sentence of the epilogue has me really confused, to the point that I'm wondering if I should have read another book as a background. It was also confusing in the constant twists and turns and back and forth narrations. Normally, I like this in a book, but I found myself getting lost. I also didn't like how contrived some of the t This book was so confusing. It set up a great mystery that started out as beach-read style fun and then turned into an intense thriller in the last 2 chapters. The last sentence of the epilogue has me really confused, to the point that I'm wondering if I should have read another book as a background. It was also confusing in the constant twists and turns and back and forth narrations. Normally, I like this in a book, but I found myself getting lost. I also didn't like how contrived some of the twists were: fake deaths, mistaken identity, illegitimate children, etc. I am a total fan girl of Beatriz Williams, let’s just get that out of the way right off the bat. I love her books. She has a beautiful, lyrical story telling style and I am almost always completely engrossed in her novels! This novel was all over my Twitter feed for weeks and I broke down and bought it because I couldn’t pass up such an interesting sounding novel plus it’s set in WWI so you know I was all over that!So I am not sure how to review this one. It had so many elements that should have I am a total fan girl of Beatriz Williams, let’s just get that out of the way right off the bat. I love her books. She has a beautiful, lyrical story telling style and I am almost always completely engrossed in her novels! This novel was all over my Twitter feed for weeks and I broke down and bought it because I couldn’t pass up such an interesting sounding novel plus it’s set in WWI so you know I was all over that!So I am not sure how to review this one. It had so many elements that should have worked well together. Criminal activity, romance, family secrets, exotic location, mystery, danger. So many things that promised a stunning novel but for me it just fell flat. I spent a long time wondering what it was and for me it was the characters. Virginia was supposed to be this strong leading lady who was able to dazzle this womanizing officer making him change his ways. But for me she was just blah. Nothing stood out to me and when she arrives in Florida, she seems almost broken and just too quiet and fragile to be taken seriously as a leading lady. That to me set the tone for the whole novel. I wasn’t impressed by her and had trouble seeing what it was about her that made Simon love her so much. Sure she was innocent and young but I found that even more unbelievable and frustrating. I also didn’t think enough time had passed between the time they fell in love and her time in Florida. Three years in between I think……it seems all too soon for enough time to go by. I liked Simon just fine. I thought he was charming (as he was meant to be) and likable, but I couldn’t understand why a woman as flat as Virginia managed to get him all besotted. I felt like she had so much promise in the beginning when she told the story of how they first met and I thought ok here is a bold woman and then she just came across broken and that made me sad because I had hoped she would be more exciting. So why did I keep reading? Well the mood felt very much like a Gothic novel or a noir read. It kind of had the same atmospheric feel as the novel Rebecca. I liked the unease and the shady characters and the complexity of the plot. I liked not knowing who to trust and what was plausible and what wasn’t. The plot itself kept me on edge and intrigued. I wanted to know who was lying and who was telling partial truths and how those little lies fit together within the greater story. In the end, I ended up rating this novel a solid 3. I liked it enough to finish it but it wasn’t the best example of William’s abilities as a writer. I would obviously still read her books but this just isn’t one that would stick with me and that I could say ‘I loved it’….it was ok but there are better novels by her that truly shine and showcase her signature style. 5 "Discerning What is Real" Stars for the story and narration! Loved both the historical fiction and the mystery in this story. There are even elements of romance weaved in--though romance is definitely not one of the primary focuses of the book. The narration by Eva Kaminsky which seamlessly switches back and forth between English and American accents is also fabulous. Alex Wyndham performs a much smaller role but as always does a fantastic job. This was my first book by Beatriz Williams, but I w 5 "Discerning What is Real" Stars for the story and narration! This was my first book by Beatriz Williams, but I will definitely be looking to read/listen to her backlist in the near future. Too much of the story is told in flashback style. The story at times was rambling, confusing, repetitive and tedious. I kept wanting the author to 'get to the point.' I felt the development of the characters was disjointed from the plot. I really only stuck with this novel to find out how it ended. Having very much enjoyed listening to The Wicked City earlier this year (and being a fan of this author’s alter-ego, Juliana Gray), I was keen to listen to Beatriz Williams’ latest offering, Cocoa Beach, which follows a young widow as she tries to discover the truth about the estranged husband who recently perished in a house fire at his Florida home. It is loosely linked to both The Wicked City and the book which preceded it, A Certain Age, insofar as some of the characters have either appeared or been mentioned in one or both of those novels, but otherwise Cocoa Beach can be enjoyed as a standalone. In 1917, Virginia Fortescue flees her oppressive home in New York to drive ambulances back and forth between the trenches and the field hospitals of Northern France. The USA has not yet joined the war, but she and a group of other volunteers led by the wealthy and formidable Mrs. DeForest are out there “doing their bit”, in whatever capacities they can be useful. On a trip to pick up some wounded men and take them to the hospital Mrs. DeForest has set up in an old château, Virginia meets the handsome, charismatic Captain Simon Fitzwilliam, an army surgeon, and he ends up travelling back to the hospital with her in order to inspect the facilities. There’s an instant frisson of attraction between the two, although Virginia is wary; not only is he quite a bit older than she is (she’s twenty-one, he’s mid-thirties) and almost too good to be true, but her complicated relationship with her stern, reclusive father means she has little experience with men and is uncomfortable around them. Yet by the end of this brief time spent together, Virginia is desperately smitten and so, it seems, is Simon, and he tells her he’s going to write to her. Virginia is on cloud nine – until one of the other girls in her unit tells her Simon is married, with a young son. BW's latest is set in present day 1920's Florida flashing back to WWI where Virginia and Simons story began. I was looking for a light summery read when I picked this up its not really that. Filled with suspense and drama, it's chapter endings ask more questions than provide answers. It definitely keeps you guessing up until it's last chapters! A solid three. I like this author, preferred Coming of Age, my first novel of hers. This was the second. I began to get engaged in the twists and turns and the mystery, and the lush setting. I would consider this a poolside or beach read. Not a not to be missed. But I was glad to continue another aspect of the story from the recent first novel. I loved all of Beatriz Williams other books and couldn't wait for her new one Cocoa Beach. The others I couldn't put down, this one I put down too often. The story line was twisted back and forth, with a confusing ending. Still wondering what the last scene meant??????? This was the inaugural pick for Instagram's Salt Water Reads Book Club back in July and it was the PERFECT choice! Let me just say I have never read a Beatriz Williams book before and I am SO happy I finally did! I LOVED it! It combines two of my favorite genres: historical fiction and mystery. The writing style is compelling and I love the alternating chapters between Virginia's time in France and her time in Cocoa Beach. I found myself flipping through the pages trying to find out what happened This was the inaugural pick for Instagram's Salt Water Reads Book Club back in July and it was the PERFECT choice! Let me just say I have never read a Beatriz Williams book before and I am SO happy I finally did! I LOVED it! It combines two of my favorite genres: historical fiction and mystery. The writing style is compelling and I love the alternating chapters between Virginia's time in France and her time in Cocoa Beach. I found myself flipping through the pages trying to find out what happened to Simon. These are complex characters that kept building until the very end! The VIVID descriptions of the place and time transported me there. I could see every facet perfectly clear. Every character, every setting, it was IDYLLIC. The ending did confuse me a bit but thanks to the Salt Water Reads discussion, the author provided some clarity which led me to purchase THE WICKED CITY and A CERTAIN AGE - both prequels to COCOA BEACH. Yes, you can read this as a stand alone novel but I was so engrossed in this story that I had to tie up some loose ends and buy these books. I am officially a fan of Beatriz Williams. And yes #BeatrizBinge is absolutely a thing!! When I started to read Cocoa Beach did I not know that the previous two books A Certain Age, The Wicked City were loosely connected to this book. I only realized that when I started to read The Wicked City. Do I regret reading them in reversed order? Not at all, although I wish I could read them all again since I absolutely loved reading the books. Coca Beach takes place both in after-war Florida and on the battlefield of France during WW2. It's in France Virginia Fortescue meets the dashing Cap When I started to read Cocoa Beach did I not know that the previous two books A Certain Age, The Wicked City were loosely connected to this book. I only realized that when I started to read The Wicked City. Do I regret reading them in reversed order? Not at all, although I wish I could read them all again since I absolutely loved reading the books. Coca Beach takes place both in after-war Florida and on the battlefield of France during WW2. It's in France Virginia Fortescue meets the dashing Captain Simon Fitzwilliam who she falls in love with. But, five years later is she living alone with her daughter after leaving Fitzwilliam after marrying him. Now, there is nothing I love more than a good mystery and here we get several. What really happened to Simon Fitzwilliam in Florida, why did Virginia leave him and could Virginia be in danger? The only thing more interminable than Virginia Fitzwilliam's melodramatic saga was my attempt to read it. Normally, I'm a fan of Beatriz Williams' work. I've read everything else by her, and enjoyed it all. Devoured it, most often. But this book was an altogether different proposition. Not only was the plot inconceivably slow, but there was not a single important character that I felt any connection to whatsoever. I couldn't root for or against any of them, because I simply didn't care what happ The only thing more interminable than Virginia Fitzwilliam's melodramatic saga was my attempt to read it. Normally, I'm a fan of Beatriz Williams' work. I've read everything else by her, and enjoyed it all. Devoured it, most often. But this book was an altogether different proposition. Not only was the plot inconceivably slow, but there was not a single important character that I felt any connection to whatsoever. I couldn't root for or against any of them, because I simply didn't care what happened to them. The only character that I found interesting appeared and was gone again in the space of a few chapters. Williams' books often switch between two narratives, which usually has the effect of seeming to speed up the action. The opposite happened here. And since the same characters appeared in each storyline, it was harder to follow the storyline. I love Beatriz Williams because she writes. She doesn't take 3, 4 or even 5 years to put out a book. She pumps them out every 6 months or so and they do not disappoint - at least in my opinion! I also love her because her books are not predictable in any way. I'm always guessing and trying to figure out what the heck is going on! This book tells the story of Virginia Fortescue, sister of Sophie from A Certain Age. Remember how her husband was always supposed to send for her and never did? Well, I love Beatriz Williams because she writes. She doesn't take 3, 4 or even 5 years to put out a book. She pumps them out every 6 months or so and they do not disappoint - at least in my opinion! This book tells the story of Virginia Fortescue, sister of Sophie from A Certain Age. Remember how her husband was always supposed to send for her and never did? Well, now that mystery is explained in this book. I thoroughly enjoyed the story. I happened to be home sick these last 2 days and Ms. Williams' book was the perfect distraction for me. I devoured it. If you enjoy historical fiction give this a shot. If you read A Certain Age first you will understand a bit more about Virginia's feelings. Otherwise this book takes you from the WW I front in France to a musty old manor in Cornwall to an orange plantation in Florida to boot leggers in 1920s Miami Beach! All kinds of adventure! Cocoa Beach by Beatriz Williams is told in alternating time periods, in France during WWII and 5 years later in Cocoa Beach, FL. This was my first Beatriz Williams novel and it won’t be my last. I found that most of the chapters ended on cliff hangers and then switched back and forth between the two time periods, which left my anticipation continuous from start to finish. Cocoa Beach was full of drama and with every one of them I was left wanting more answers. Despite WWII and life immediately after WWII being truly desperate times, I found charm in the pages of this book. The romance between Virginia and Captain Simon Fitzwilliam is what true love stories are made of, but was it real? I found myself constantly questioning the characters motives and trying to decipher the truths from the lies. Cocoa Beach is packed from the beginning to the end with rich history, frantic situations and character developments. While I found the entire book to be highly detailed and thoroughly satisfying I did find the ending to be a bit rushed. Don’t get me wrong, I didn’t hate the ending, I just wanted more. I wanted it to be treated with the same finesse the rest of the book was. This ending was one to be savored. I will say after completing the book and doing some research on the ending, I discovered the part I was most confused by related to another one of Beatriz Williams' novels, The Wicked City. If you enjoy historical fiction that combines charm, betrayal and anticipation, Cocoa Beach by Beatriz Williams is for you! Virginia Fortescue's life hasn't really been easy. Her mother was murdered when she was just a child and obviously this has impacted her tremendously. As an adult, she has spent a lot of time driving ambulances in the war. While at the war, she met Dr. Simon Fitzwilliam and sparks flew. They got married and had a child, but things got complicated and they became estranged. Virginia gets news that Simon has died in a fire at his house in Florida. Virginia hurries down there to see what exactly ha Virginia Fortescue's life hasn't really been easy. Her mother was murdered when she was just a child and obviously this has impacted her tremendously. As an adult, she has spent a lot of time driving ambulances in the war. While at the war, she met Dr. Simon Fitzwilliam and sparks flew. They got married and had a child, but things got complicated and they became estranged. Virginia gets news that Simon has died in a fire at his house in Florida. Virginia hurries down there to see what exactly happened and the more she discovers about Simon, the worse it gets. It doesn't help that Simon's twin, Samuel, is also down in Florida sending her mixed messages about Simon and Agent Marshall is constantly warning her to go back home as she and her daughter could be in danger. The more Virginia uncover about the truth surrounding her husband, the more she wants to find out despite the dangers involved. 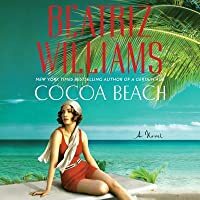 Cocoa Beach by Beatriz Williams is a suspenseful thriller set in Prohibition age Florida that kept me on the edge of my seat. Oh man! I can't give anything away so my review will just be my raving. This book is just perfect. I spent the entire book trying to put the pieces together. I didn't know who to love and who to hate. Who wasn't playing fair and who was honest. The end had me reading for four hours straight (and into the wee morning hours) just to finish and figure it all out. I loved it all!!! Prepare to be sucked in. This can be a stand alone book, but I highly recommend reading at least A Certain Age first... Oh man! I can't give anything away so my review will just be my raving. This book is just perfect. I spent the entire book trying to put the pieces together. I didn't know who to love and who to hate. Who wasn't playing fair and who was honest. The end had me reading for four hours straight (and into the wee morning hours) just to finish and figure it all out. I loved it all!!! Prepare to be sucked in. This can be a stand alone book, but I highly recommend reading at least A Certain Age first...possibly even Wicked City. Both good books, but this is the icing on the cake! I’d never received a compliment like that. Certainly not from a grown man, a man of mating age. I didn’t even know that kind of man, other than that he existed, a separate and untamed species, kept in another cage from mine on the opposite end of the zoo. And that was well enough with me. I had no interest in mating. Having survived such a childhood, I thought myself practical and resourceful – and I was, by God! Because while houses burned down regularly, and people died all the time, I had never imagined that Simon could meet his end like that. You could not extinguish my husband in mere flame. I simply wasn’t possible. Cocoa Beach was a mesmerizing read. Beatriz Williams has more than mastered her craft. Her words imbued her characters with a luxurious texture and her lush and effusively detailed scenes pulled me right inside the narrator’s head. I could see the cigarette smoke curling, smell the orange blossoms, hear the car engines, and feel the reverberations of bomb explosions. But the characters – oh the characters! I was spellbound and confounded by them. I frequently waffled and felt conflicted, as I did not want Simon to be as wicked, greedy, unscrupulous, or as untrustworthy as Virginia was being led to believe. But someone was lying and I could not decide on whom as his entire family proved to be as slippery as eels with their words. Saying a lot while saying nothing precisely, which required considerable skill and talent from the author to maintain. Since I can't just say, "Read it now. It's fabulous," I'm pounding out this review on a computer with an Internet connection that's tenuous at best to get this review posted on release day! I can't say enough about how Beatriz Williams grabs readers and pulls them into a story with her dramatic and breathtaking plots and stunning settings. From the streets of New York in A Certain Age, to Florida's tropical coast in Cocoa Beach, Williams pens stories that make one feel as though she's lived in t Since I can't just say, "Read it now. It's fabulous," I'm pounding out this review on a computer with an Internet connection that's tenuous at best to get this review posted on release day! I can't say enough about how Beatriz Williams grabs readers and pulls them into a story with her dramatic and breathtaking plots and stunning settings. From the streets of New York in A Certain Age, to Florida's tropical coast in Cocoa Beach, Williams pens stories that make one feel as though she's lived in those locales (or at least researched them!) for a thousand years. Not only that, but the characters are absolutely mesmerizing! I don't know how she does it! As a noob reader of her books, I admittedly went into A Certain Age, a little anxious. You never really know what you're going to get with a new author, but I couldn't put the book down--the same goes for this one. Virginia Fortescue's story switches from past to present, but never feels disjointed as can sometimes be the case with stories written in this manner. There's quite a lot of mystery involved, but it doesn't strictly feel like a suspense novel. There are strong elements of romance as well as nods to The Great War and life on the front. I thought the plot twist at the end of the story was a little out of left field, but after having read it twice, it's growing on me! Cocoa Beach is a must-read for fans of stories of the Jazz Age, Prohibition, suspense, and romance. There's no other book this year set in the 20s that I can think of that I'd want to take poolside with me other than this fab story! Three cheers for Beatriz Williams and Cocoa Beach! Grab your book, your drink, and your beach towel and get ready to journey to 1920s Florida.